Is your fabric stash out of control? Have you forgotten half of what you have? If you’re like me, you have more fabric than you will ever be able to use, perhaps more than your grandchildren will be able to use. How do you tame this beastly hoard without driving yourself to drink? If we were to approach this like a home organization show, we’d be laying three tarps out in the yard and throwing every piece of fabric we find into one of three piles: KEEP, DONATE, TRASH. But like you, I don’t want my fabric on my lawn, susceptible to sun exposure and available to be swiped by the neighbor-lady closet quilter who thinks (probably correctly) that I’ll never miss it. So, I’ll just tell you what I did. What we all so endearingly refer to as a “stash,” (something you hide from others in shame) is really more of a “collection,” isn’t it? For many of us, it is begun, cultivated, grown, and curated over years, partly out of love, partly out of unhealthy obsession. How many hundreds of quilt shop trips, and hours spent online searching for the perfect yardage of the perfect print, in the perfect color, how many impulse buys, wonder-whys, and “I-love-it-too-much-to-cut-into-its” are lurking in the corners of your sewing room? We hide them away, to be discovered once again in a later year–by us, if we’re lucky! Why should we deprive ourselves of the joy we felt the first time we brought that remnant home from the fabric store? The visual and tactile pleasures given us by our fabric are renewable–if we were to only partake of the fabric we already have. 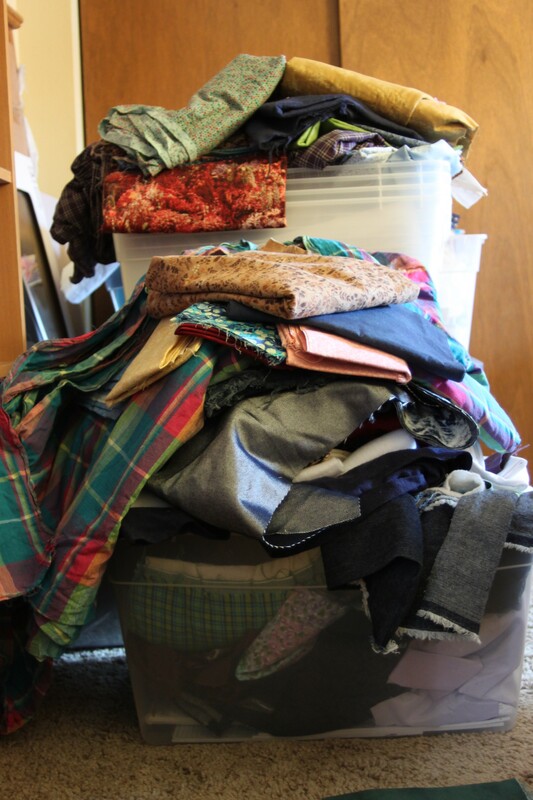 This inner monologue led me to realize that I need to see my fabric….and preferably not in a giant heap. I saw a picture shared on the Sewing Center of Cheyenne’s Facebook page of a bookshelf full of large and small fabric bolts. It was well-organized, color-coordinated, and as much fun to look at as all the fabric lined up in a fabric store. (That’s how they get you, you know!) This requires each piece of fabric to be folded or stored in a somewhat uniform presentation, which differs a lot from having a big bin full of…some rolled remnants, some fat quarters, some huge folded yardages that I just couldn’t pass up…. By the way, fat quarters are a whole other story. So let’s start with taming those yardages. I kind of consider anything that is WOF x 1/3 yd or larger to be “yardage.” Even if the dimensions are a little weird, as long as they’re not a “fat” anything, this system will work. After seeing that fabric could look just as lovely arranged on a shelf in my home as it does at that sneaky fabric store, I started to research fabric bolts. I found that fabric stores are happy to give you the empties, free of charge, because they are just going to throw them away anyway. But there were some problems with this. Fabric bolts are not acid-free and can eventually cause your fabric to discolor. They’re meant for short-term storage. I would need, like, 45 million bolts if I wanted to display each fabric separately. And I still have decades of quilting and accumulation ahead of me. Sooooo……..
As alternatives to space-hogging, fabric-rotting bolts (which are a perfectly acceptable solution if they work for you, by the way,) I found these options. They are both rigid plastic “bolts” of uniform size. These types of bolts are nice for a few reasons. They are stiff, like a regular fabric bolt, and hold their shape on the shelf. Because they are molded plastic, they often also have built-in clips of some kind to hold the ends of your fabric, so no pins are needed to secure. They do look lovely when stacked on end on a bookshelf. Depending on which bolt option you choose, you will roll your fabric differently. I use the Current comic book boards for anything 2 yds down to 1/3 yard, and the Life Magazine size for greater yardages. These instructions assume that your fabric is already folded lengthwise in half, like it came off the bolt at the fabric store. Fold fabric crosswise twice (with the selvage edge toward you, fold from the right and left) into a strip about 8” wide. Roll from selvage edge onto small comic book board. Secure with paper clips. Fold the lengthwise into thirds. Roll onto the smaller comic book board, tucking the end under to create a folded end. Secure with paper clips. Fold fabric lengthwise in half. Roll onto Life Magazine board and secure with paper clips. Some online sellers will ship your fabric with a label attached containing some of this information. In those cases, you can just transfer the label right to the board. Talk about easy! Another favorite method, if you don’t want to store the fabrics on-end, like they are on bolts, is to flat-fold them around a 6” quilting ruler. If you already have the ruler, this idea has the bonus of being free! This system would work well if you have wire shelving, as you can stack the flat folds, rather than turning them on edge like you can on the bolts. When your fabrics are stacked, you can insert a long quilting ruler above the piece you’d like to retreive, then lift the fabrics above it away, so you can pull it out without messing up your nicely folded fabrics. If you choose to roll your fabric using one of these methods, you can decide as you go what to do with the pieces you come across. You can make the “Toss” and “Donate” piles now, and roll only the fabrics you like and want to keep. Set up a craft supply garage sale, and the merchandising is a breeze. Also, it’s totally ok to throw out thin, worn or ugly fabric. If it’s low-quality and you can’t bring yourself to put your time into it, maybe no one else should either. These fabrics can also be used by animal shelters to stuff dog beds, if you just can’t bear the thought of throwing it away. If you like the “fabric bolt” approach, you can flat-fold your fat quarters with similar results. I fold them in sixteenths—always folding the short edges to meet in the center. When you’re done, you have a rectangle that is about 4 ½” x 5 ½”, with one long, solid, folded edge. Many quilt shops already fold fat quarters this way, which was part of the reason I chose this method. If you have the budget for it, fat quarters display nicely in a media tower meant for CDs and DVDs, though the tower may not come with as many shelves as you could use for this purpose. If this happens, the bottom of the tower is a great place to store full-line fat quarter bundles. For fabric of other dimensions, like regular quarter-yards, you can fold them into similar-sized rectangles that will display right next to your fat quarters. They can also be stored on separate shelves if you prefer to know that the cuts are different without unfolding them. You can then either make a variety of scrap quilts, or sell groups of strips or squares on eBay or Etsy. And, believe it or not, it’s not illegal to just toss them. Don’t hang onto them if you’re not going to use them. Some fabrics from the 70s should have stayed there…because they’re just not coming back. That said, some hideous, dated, strangely-colored fabrics from the toss pile might look great in a scrap quilt!